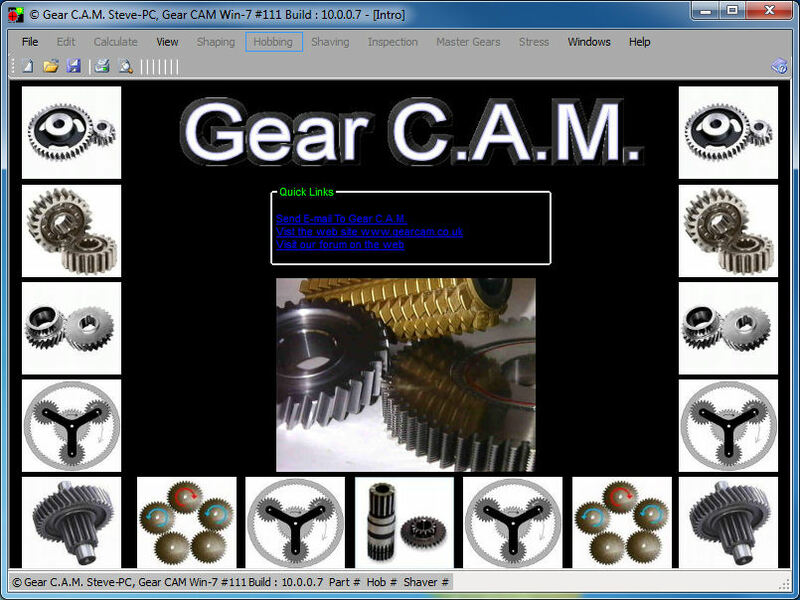 Gear C.A.M. Gear Design / Calculation Software for Involute Spur & Helical gears, Racks, Pinions & Internal Gears, 3 Gear Trains, Sun Planet & Ring gear sets and now BS3550 Splines. It is very useful for helping turn existing Gear Data into more useful inspection or machine setting information. Includes in Add Mod section find Pitch from Number of teeth & Canter Distance. Additions Include Graphical Line Of Action and step rolling around the LOA. Design data can be output in *. DXF format for use in AutoCAD etc. see the demo section for examples. All designs can be seen visually as shown on the examples. All output can be printed. All inputs can be Imperial or Metric or any combination. Data input is simplified through the software's ability to make many calculations automatically, from as much or little information as the engineer has available. Gear C.A.M. has the ability to calculate Differential gears for Hobbing Helical gears as well as gear trains for Churchill RH8 Hobbers. A section is available to calculate cutting times for both Hobbing & Shaping. The system will run on any standalone or networked PC.